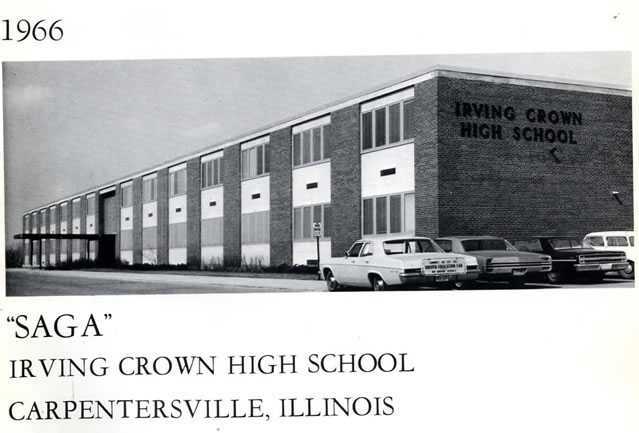 Carpentersville Irving Crown H.S. "Vikings"
Carpentersville (population 30,586) is located in the northeastern portion of Illinois. Carpentersville is situated in the far northeast corner of Kane County. Illinois Route 25 is the main roadway through Carpentersville, connecting it to Interstate Highway 90 just three miles to the south. Illinois Route 31 also passes through town while Route 68 brushes its southern border. The Fox River flows to the west of town. A nice history of the town of Carpentersville can be viewed at http://en.wikipedia.org/wiki/Carpentersville,_Illinois . In summary the article points out that Carpentersville was first settled in the late 1830s by two brothers with the last name of Carpenter. They named the area Carpenter's Grove. In 1851 the land was platted for a town and the town was named Carpentersville. The town was officially incorporated in 1887. 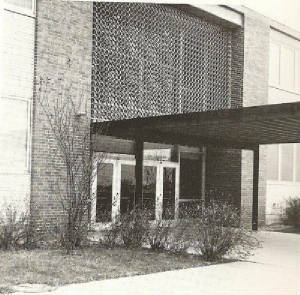 According to another Wikipedia source (http://en.wikipedia.org/wiki/Dundee-Crown_High_School) the Carpentersville area supported one high school, that of Dundee Community High School, from 1874 until 1964. It was in that year that the population of the area forced a second high school to be opened. 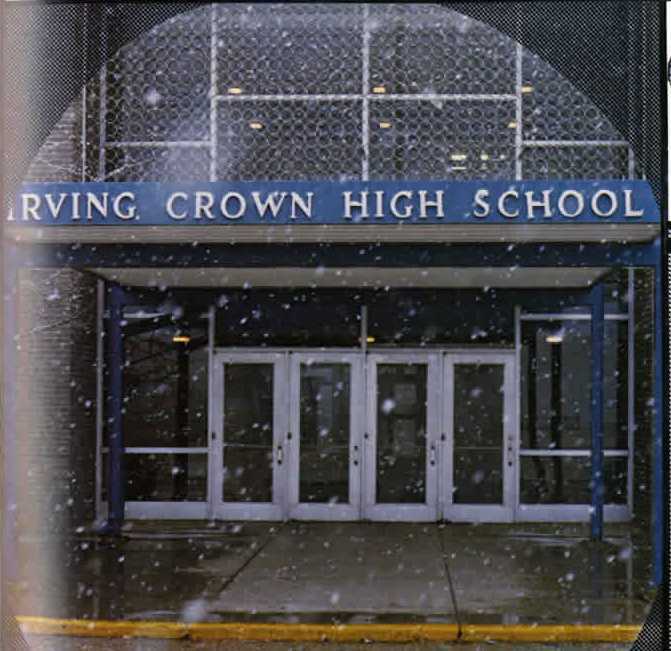 Irving Crown High School was opened to accommodate this population boom. Carpentersville and the surrounding towns of East Dundee, West Dundee, Algonquin, and Sleepy Hollow supported Dundee Community High School and Irving Crown High School for twenty years. Declining school enrollment led to the decision that only one high school was needed for the area. In 1983 Dundee Community High School and Irving Crown High School were closed and merged into one high school. 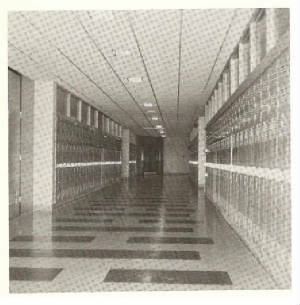 Dundee-Crown High School was the name given to the "new" high school of Carpentersville. Dundee Crown High School continues to serve the high school-aged students in the area today. To view an excellent website that includes information on Dundee and Irving Crown High Schools check out www.dundeehs.com , submitted to us by webmaster Annie Bahnmiller! Irving Crown HS team nickname: the "Vikings"
Irving Crown HS FIght Song: "Cheer for the Vikings of Crown High School"
The Vikings and Lady Vikings competed in many different sports during the 20 years the school was open. Several of these sports are listed on the IHSA website (www.ihsa.org). We have documented these sports below. As you can see, we are still interested in the school's team uniform colors, school fight song, coach's names, team records, and any other items you may wish to share with others on this page. The Viking's baseball program won one Regional Championship. 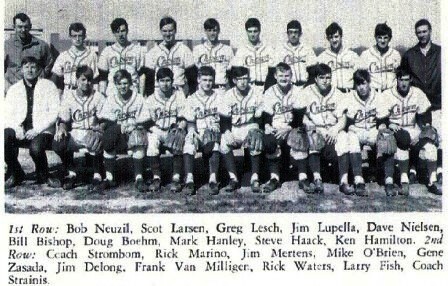 We are searching for the coach's name and team record of other great Irving Crown High School baseball teams as well. "Carl Mueller, Frank Van Milligen, and Rick Waters were all conference. We almost won the sectional too, lost 2 to 1 in the championship against LaSallle-Peru who wound up taking second in the state." Coach Jim Hinkle appears to have led the Irving Crown High School boys basketball program for wseveral years, though most of the information is missing. We only know that the Vikings won a Regional title in the 1980-81 season. The grid iron heroes of Carpentersville Irving Crown HS had some real nice seasons. The team of 1976-77 finished with an 8 - 2 record under the direction of head coach Jerry Curtright. Other seasons with above .500 records are listed below as well. Coach Al Zinke led the grapplers of ICHS to some incredible duel meet records. The team of 1982-83, the school's final season, ended with an impressive 16 - 1 record. Two individual earned medals at the IHSA Class AA State Track Meet. Their excellent accomplishments are listed below. The Lady Viking basketball program sent a team the deepest into the IHSA playoffs by reaching the Sweet 16 round of play in the 1979-80 school year. The team record is needed. Regiional Championships were won in 1981 and 1982 as well. The Irving Crown Lady Viking thinclads won a Sectional Championship in 1983, the school's final season as Irving Crown High School. The IHSA website does not list any individual medalists from the school however. One individual scored a big victory for Irving Crown High School in the IHSA's Individual Events competition. David Cantry was crowned STATE CHAMPION in the 1969 competition category of "After Dinner". David's efforts led to ICHS landing a seventh place finish in Individual Eveents Team Competition. 1968-69 David Cantry "After Dinner" STATE CHAMPION!! Team Finished SEVENTH at IHSA State Meet!! Coaches: Robert Seamans (athletic director) football; Robert Sayre basketball; Tom Miller track and cross country; Stan Strainis baseball; Richard Bates wrestling.